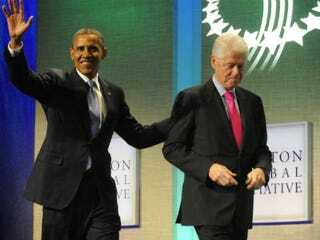 Barack Obama and Bill Clinton faced many of the same difficulties during their presidential administrations. The Republican Congress continues to dog President Obama, while the House and Senate, both GOP led, kept President Clinton in their sights during both terms of his presidency. With those similarities, there are differences: white liberals. Obama has experienced a nosedive in support from whites in the past two years, from 61 percent in 2009 to 33 percent now. In terms of criminal justice, Obama signed the Fair Sentencing Act, which decreased judicial disparities in punishment; by contrast, federal incarceration grew exponentially under Clinton. Many argue that Obama is an ineffective leader, but the legislative record for his first two years outpaces Clinton’s first two years. Both men came into power with a Democratically controlled Congress, but both saw a sharp decline in their ability to pass their own legislative agendas once GOP majorities took over one or both chambers. President Obama has experienced a swift and steep decline in support among white Americans — from 61 percent in 2009 to 33 percent now. I believe much of that decline can be attributed to their disappointment that choosing a black man for president did not prove to be salvific for them or the nation. Perry argues that many of Obama's accomplishments during his time in office are comparable to, if not better than, Clinton's. Obama's record on issues such as health care, gay rights and black incarceration far outpace Clinton's, and yet white liberal scorn continues to rain down on the head of the president. This double standard continues to plague the Obama administration, but he needs to find a way to reverse the trend before this time next year. In other news: Top 5 Wrongful Executions?